Always Show Profile Dialog Before Start - Instructs DiskSorter to always show the profile dialog before starting the file classification process. 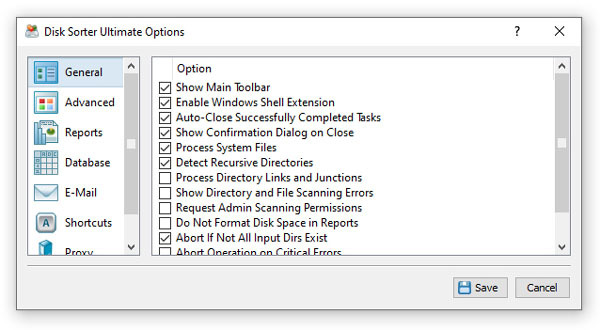 Auto-Close Successfully Completed Tasks - select this option to automatically close the process dialog after finishing the file classification process. Automatically Check For Product Updates - select this option to instruct DiskSorter to automatically check for available product updates. Show Scanning Access Denied Errors - select this option to see error messages when DiskSorter is prevented to scan files in a directory. 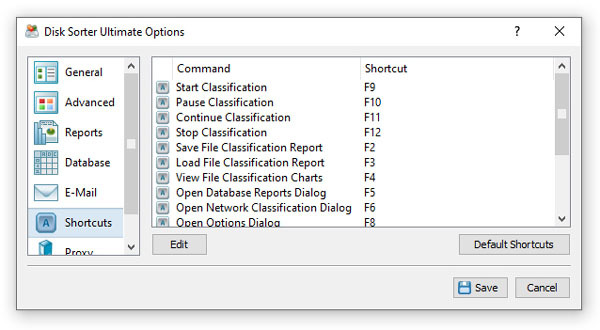 Process System Files - select this option to classify system files and directories. Abort Operation On Critical Errors - by default DiskSorter is trying to process as many files as possible logging non-fatal errors in a process log. Select this option to instruct DiskSorter to abort operation when encountering a critical error. 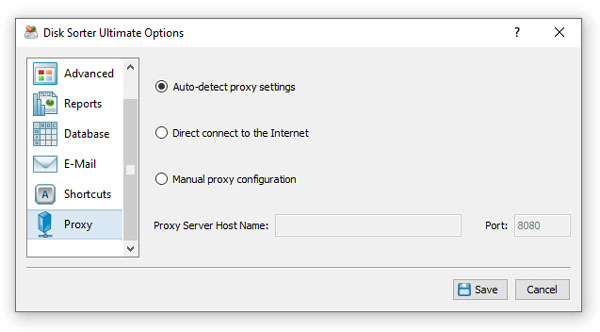 The 'Proxy' tab provides the user with the ability to configure the HTTP proxy settings. DiskSorter uses the HTTP protocol in order to inquire whether there is a new product version available on the web site. By default, DiskSorter detects proxy settings and connects to the Internet directly or through an HTTP proxy depending on the configuration of the host computer. Depending on a specific host and network configuration, the user is provided with the ability to connect to the Internet directly, trough automatic HTTP proxy discovery or manually by entering the HTTP proxy server name and port.